Hong Kong is called home to massive numbers of companies because of their reputation of hosting numerous trade shows. Previously, we visited the Bar & Restaurant Trade show. This time, we stop by the Hong Kong Electronics Trade Show! It’s not just the place for the average geek; we spotted lots of businessmen seeking for opportunities too! 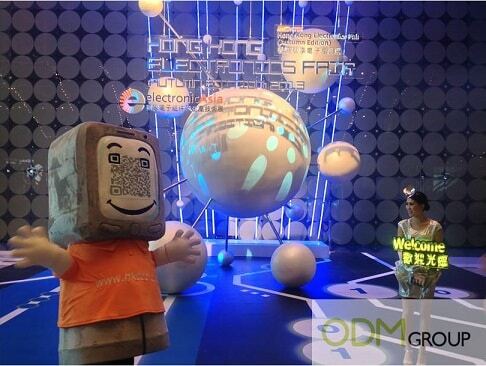 We were first greeted at the entrance by a science-fiction decoration which showcased the theme of the Hong Kong Electronics Trade Show. Although it was the last day of the Hong Kong Electronics Trade Show, it was still flooded with booths and people. We are pretty sure that the Hong Kong Electronic Trade Show hosted massive amount of people the past few days. Goodies like free ice cream and popcorns were given out to all visitors. Electronic gadgets like headphones, speakers, video cameras, battery chargers etc. were a common sight throughout the trade show. We feel that the main selling point of this trade show was the pre-set theme. This is an interesting marketing approach adopt by the Hong Kong Trade Development Council (HKTDC). The entrance of the trade show that had their mascot and the science-fiction decoration was a massive hit with the public. Tons of people were queuing up to take a photo with them. Therefore, we believe that a strong attention grabbing first impression is important to capture the attention of audiences. Overall, we feel that the Hong Kong Electronics Trade Show is perfect for anyone who is a fan of cool gadgets and technology accessories. Or if you are just a fan of being within large crowds of people, you can check HKTDC website for the list of other trade shows that are coming up. If you have missed the Hong Kong Electronics Trade Show, you can check out the video on your YouTube Channel below!